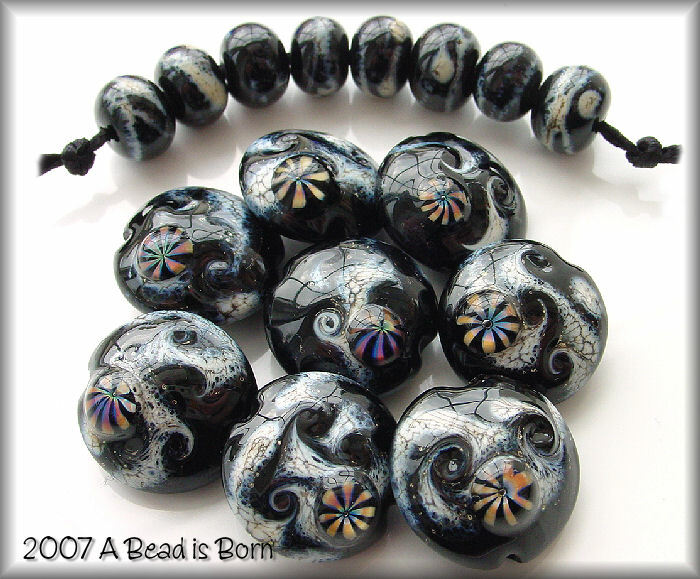 Beautiful double-sided, jet-black based lentils, decorated with silvered ivory swirls, and magnified rainbow-raku blossoms. Very unique, and pleasing to the eyes! Lentils measure 17mm X 17mm. Round silvered-ivory and black spacers measure about 8mmX10mm. All of my beads are kiln annealed, using a temperature controller. This ensures durability and long life. Each bead is wound on a 1/16th mandrel, creating a bead hole of 1.5mm.